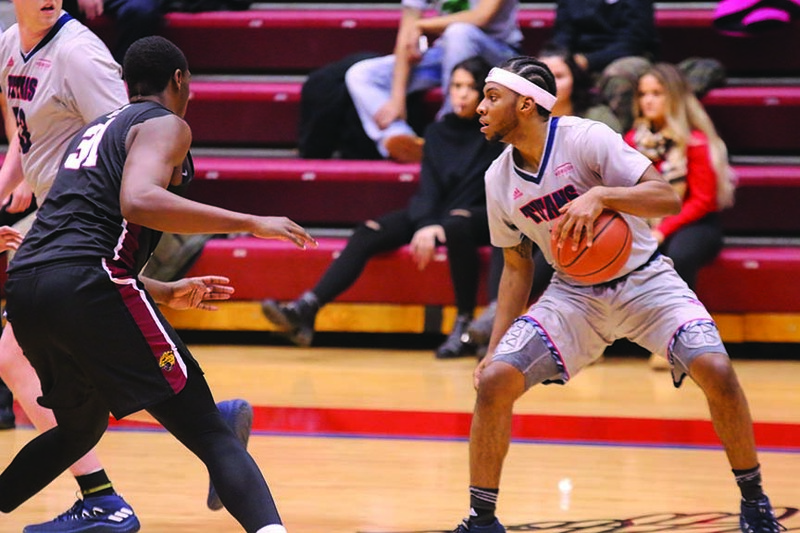 The Titans pulled out a 74-60 victory over the IUPUI Jaguars Friday night before dropping an afternoon game to the UIC Flames on Super Bowl Sunday 78-69. Detroit Mercy, sporting all-gray home jerseys for both games, came into the weekend with two tough opponents and a depleted roster. Corey Allen, Gerald Blackshear, Jermaine Jackson Jr., Isaiah Jones, Jaleel Hogan and Tariiq Jones were unavailable, the first four due to injuries. But being short of men proved no excuse for the Titans. On Friday, the Titans started out fast and fierce and put the pressure on IUPUI early, jumping to a double-digit lead with stellar three-point shooting. They also got to the line and drained free throws. But what benefited the Titans most was their ability to establish a strong defensive presence, an aspect of the game that most pleased head coach Bacari Alexander. Diversifying the scoring helped as well, with five Titans in double digits. Those contributions allowed the Titans to hold the lead the entire game. Kameron Chatman led with 21 points in 39 minutes on the floor. Detroit Mercy hoped to use that momentum when taking on a much hotter UIC team on the afternoon of Super Bowl Sunday. Junior guard Josh McFolley was red hot for the Titans early on, but the Flames were able to will themselves back into the lead before the end of the first half. It was a tight, scrappy game throughout, and the margin of error was small for both teams. Without a doubt the player of the game for the Titans on Sunday was McFolley, leading with 30 points and six steals. In addition to being the entirety of the Titans’ three-point offense, McFolley shot himself into the history books, passing Juwan Howard Jr. for ninth all-time on the school’s career three-pointers list. “It’s an accomplishment, and I credit it to my teammates because they were able to find me today,” said McFolley, who has made 149 threes. The Titans, now 7-18 overall, hope to get a few key pieces back in preparation for Friday’s Metro Series against the Golden Grizzles at Oakland. Down the road, the Titans will close out the regular season with home games on Thursday, Feb. 22, and Saturday, Feb. 24. The Horizon League Tournament will follow, with the winner getting an NCAA bid.